This is a rare, direct recommendation for me. It’s also not the best advice for everyone. (I’ll come back to that fact in a second.) In writing reviews like this one, I’m always confronted with the should-you-buy decision, and my answer is always complicated by a myriad factors that draw from who’s buying this thing and why they might want it. The earbuds my neighbor noticed, the Jabras, are simply great for my ears. They fit great. They sound great. They work great. But the kicker—what makes these earbuds really stand out—they’re remarkably good for phone calls. Like I said, the earbuds come from Jabra, a quirky Danish company that got its start making top-notch headsets for businesses and call centers. This bit of company history is the first clue that the microphones on the Elite Active 65t are exceptional. The second clue, I’d argue, is the design. 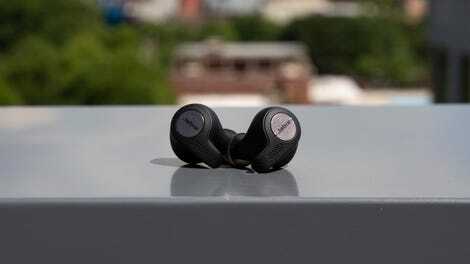 The Elite Active 65t earbud looks like a slimmed-down version of the Jabra Stealth Bluetooth headset. A little microphone unit extends from the front of the bud and sits just above your earlobe. There are actually four microphones placed around the earbud that also provide wind and ambient noise reduction. The Elite Active earbuds are also rated IP56, which means that they’re dust-proof and sweat-proof. They are not, however, waterproof enough to go underwater. Jabra also sells a non-active version of the earbuds called the Elite 65t. These are cheaper at $170 and look almost identical, except for a shinier plastic case. Both have a luxurious battery life of five hours with two more full charges in the included charging case. The whole setup works on both models of earbuds. I can listen to a podcast as a subway train roars by and not worry about cranking up the volume. I can also hear the person on the other end of a phone call with fantastic clarity—even on busy city streets—thanks to the surprisingly good noise-cancelling. More impressively, they can hear me, too. Results vary. My mom says she can hear me “great,” while my dad said, “It sounds like you’re in a barrel.” Adjusting the position of the microphone fixed that problem, however. So this is a subjective one if you’re worried about fit. That’s what I told my neighbor, too, after he asked me about buying earbuds. 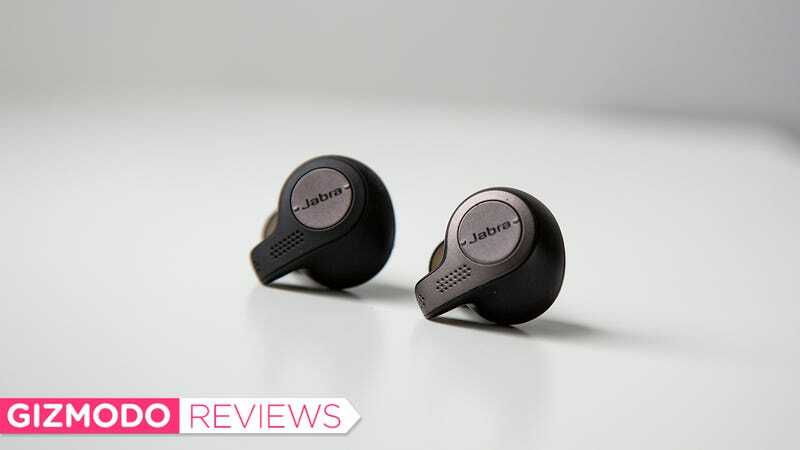 You should try on the Jabra Elite 65t before committing to them. Jump around, shake your head, and make sure they really fit. This is honestly good advice for buying any set of headphones. If you’re going to attach them to your head for several hours a day, you want the headphones or earbuds to fit. And if you can make phone calls with them too, well, you’ve got something special.